On November 26 1939, over seventy years have passed since the Polish legendary ocean liner M/S Pilsudski, one of the largest and most modern passenger ships that sailed under the Polish flag, sank off the English coast. Today, the ship herself is shrouded in mystery, probably comparable with that of the legendary ‘Titanic’. (Left: Public rooms and various views of the liner) M/S Pilsudski was the first of the two ocean liners commissioned in 1933 by the shipping company Gdynia-America Line (GAL) at the Italian shipyard Cantieri Riuiniti dell’Adriatico, Monfalcone. 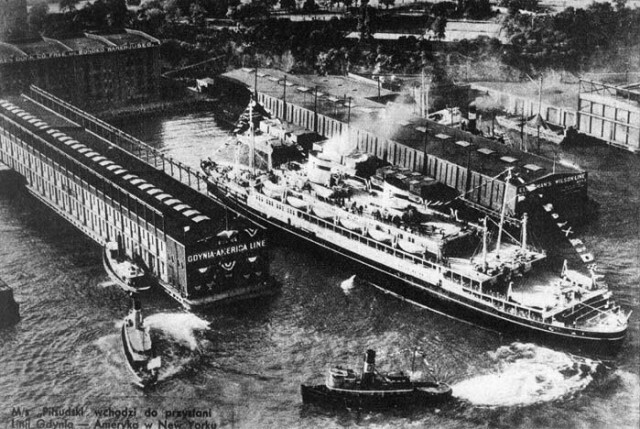 In exchange for a five-year supply of coal to Italy, Poland received from the Italian government two 14.thousand GT passenger ships (the Pilsudski, was joined by M/S Batory a year later). M/S Pilsudski – the pride of the Polish fleet – was over 160 metres long and 21.5 metre wide. On her seven decks, she could accommodate nearly 773 passengers and a crew of 350. 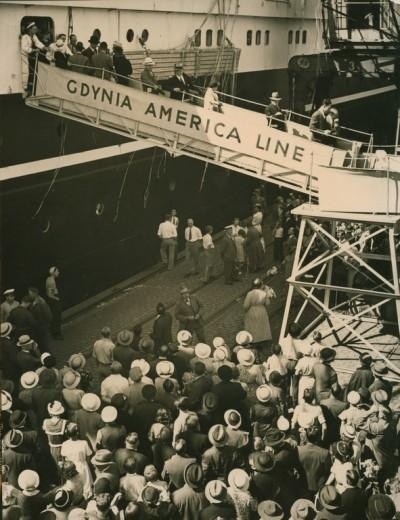 The liner’s home port was Gdynia, from where she made regular voyages to New York, acting like a bridge between Polish emigrants with their homeland. Moored at a quay, she looked impressive when seen from a distance. “The bow resembled a huge elephant’s head, with a trunk submerged in water, wrinkled at the bottom with digits marking the draught. A large silver shield decorated the head, and the eye sockets formed by hawseholes looked through bulging eyes of patent anchors. And a crowd of people boarded the ship every morning through the enormous gate in a side of the elephant”, – this is how Chief Mate Karol Olgierd Borchardt remembered her. The ship’s front was decorated with a beautiful figurehead: a bow relief sculpted by Wojciech Jastrz?bowski representing a grand badge of Pi?sudski’s legendary WW1 First Brigade, as befits a ship bearing the Marshal’s name. Launched in 1934, the ship sailed on her maiden voyage to New York on 15 September, 1935, under the command of Captain Mamert Stankiewicz. Her glorious entry into the New York harbour, among the deafening wailing of horns of all the ships she was passing by, was a great event for the crew and the Polish immigrant community in America. The ship was greeted from sea, land and air. 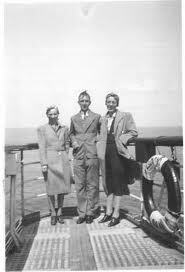 Until the outbreak of WWII, the ship sailed from Gdynia, via Copenhagen and New York, to Halifax. It was during her second voyage when, due to stormy weather, the ship’s design and structural defects were exposed. The ship showed faulty stability and hull strength. Since these had been discovered early, they could be avoided during the construction of her twin sister, M/S Batory. Even though the test of the first storm was passed without flying colours, she was a vessel we could be really proud of. 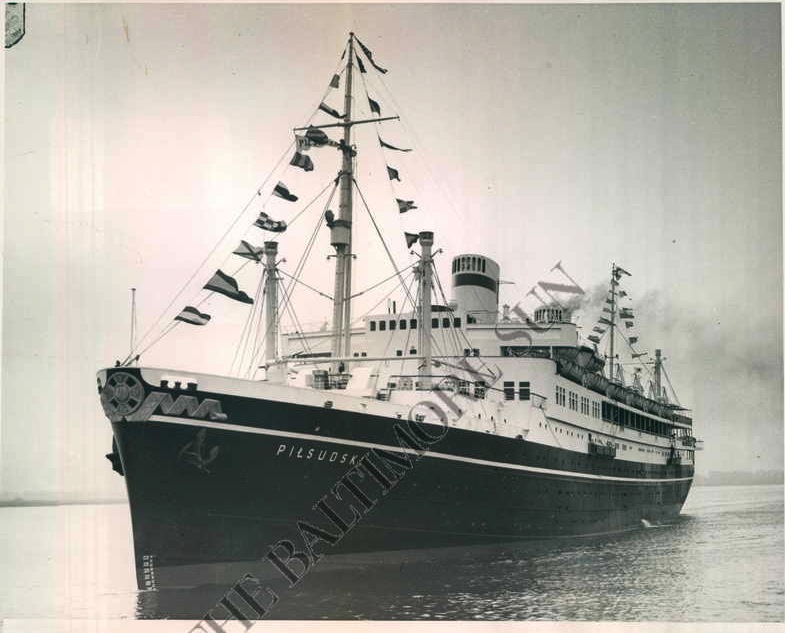 M/S Pisudski was undoubtedly a top-class liner. This luxurious ocean liner reconciled the state-of-the-art world technology and the interiors designed by best Polish artists, i.e. architects, painters, sculptors, carpet designers, and craftsmen. The passageway running through nearly a full length of the ship had – as Karol Olgierd Borchardt writes in his biography of Mamert Stankiewicz Captain, I Mean – all the features of a port street, and was a main communication artery. It was also the location of mess rooms, hotels, crew cabins, entrance to the power plant, and the engine room. 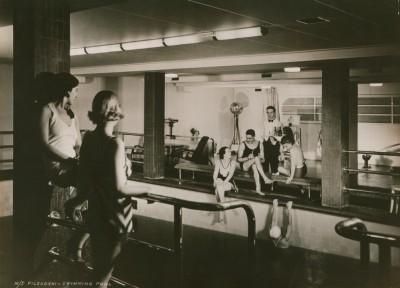 From the passageway you could get to the garage, the hospital, the hairdresser’s and the barber’s, to the laundrette, and the luxurious electric lift which carried passengers to the upper decks. A swimming pool was a novelty installed for the first time on a ship sailing under the Polish flag. 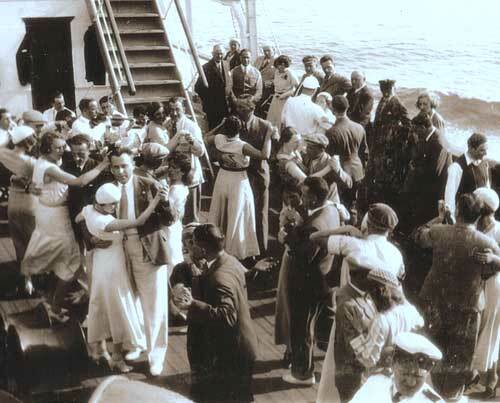 The ship was also known as the ‘International Medley’, due to the fact that materials and equipment came from dozens of countries, including the USA, Denmark, Hungary, England, Scotland, Austria and Poland. 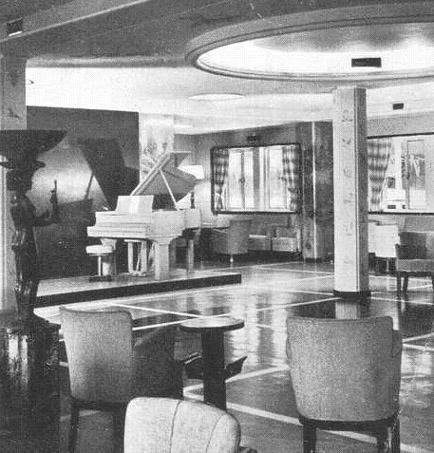 Although built to a foreign design and of foreign materials, the ocean liner maintained her Polish character thanks to interiors, furnishing and Polish haute cuisine. 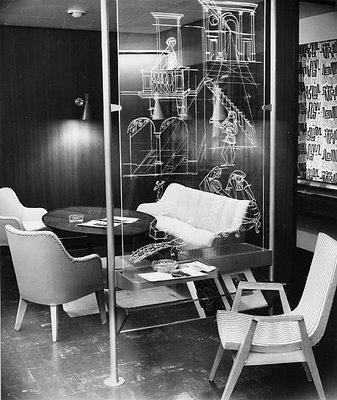 The modern construction of the ship, the beautiful lounges, the labyrinth of passageways, the competent crew – all this made the Pi?sudski very popular, also with foreign guests. Each year she made ten three-and-a-half week voyages across the Atlantic. And each time she was fully booked. Just as the enormous size of S/S Titanic made the English proud of their ship, M/S Pi?sudski stirred similar feelings in Poles. And even though she was not a colossal ship, she was the pride of the Polish fleet. After the outbreak of WWII, the Pilsudski, together with most other passenger ships and their crews, went under British command. She was converted into a military transport craft, which called at the English Port of Newcastle, from where she made her last voyage on 25 November, 1939. It went down a few hours later, most probably on a mine field, 29 nm SE off Cape Flamborough. Nearly all the crew were rescued – during the evacuation the ship’s fourth engineer got killed, while Captain Mamert Stankiewicz – after being rescued – died of exhaustion and hypothermia (he was posthumously awarded with the Virtuti Militari Cross for his bravery during the rescue operation). Visitors can learn the history of this ocean liner thanks to the exhibition prepared by the Polish Maritime Museum. This temporary exhibition, sponsored by Polish Senate Marshal Bogdan Borusewicz, presents the history of the Polish passenger shipping after Poland regained its independence in 1918, in the wake of WWI. It also sketches profiles of people related to M/S Pilsudski, including Captain Mamert Stankiewicz, chief mate Karol O. Borchardt and ship’s physician Stefan Michalak. You can also see, among others, a model of M/S Pi?sudski made to a scale of 1:130 at the Monfalcone shipyard, and a list of the rescued members of the crew. Exhibits from the collection of the Polish Maritime Museum will be a special treat for the visitors. They will include a lifebelt found by soldiers from general Stanis?aw Maczek’s division on the North Sea shore soon after the sinking and donated to the Museum by the Polish Ocean Lines, or a blanket with the GAL emblem, donated by one of the rescued seamen. The exhibition will also present artefacts such as a porthole and a dinner plate, salvaged from the wreck by English divers a few years ago, and numerous mementoes, collected by the M/S Pi?sudski Society from Great Britain. 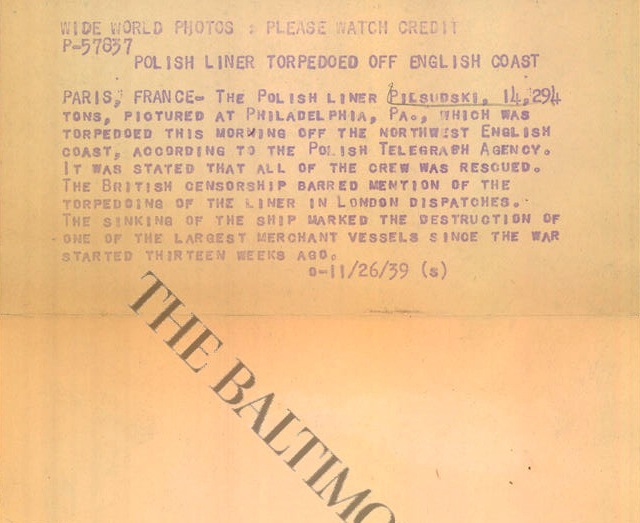 These include, among others, a bar of soap with the name ‘Plsudski’ on it, a pack of cards with the image of the ship, a brand GAL ashtray, and an information plate from the liner. 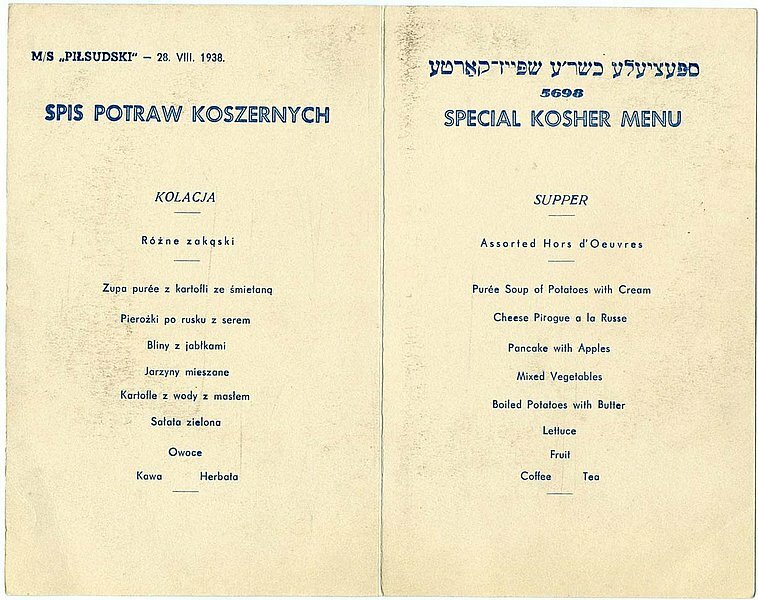 The collection, including also numerous colour brochures, documents, invoices, bills of exchange, telegrams, letters, and a sample menu were donated to our Museum by Ms. Frances Mary Oborski – the widow of the long-standing vice-president of the Pi?sudski Society and Honorary Consul of the Polish Republic Mike Oborski.